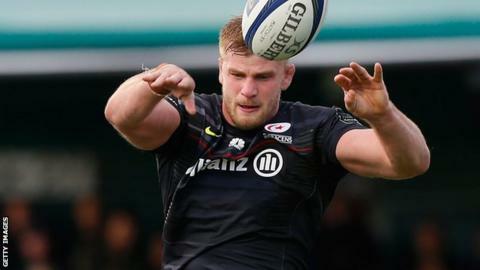 Forwards coach Graham Rowntree says the "exceptional" George Kruis can force his way into the England match-day squad for the autumn internationals. The uncapped Saracens forward received his first senior call-up on Wednesday and Rowntree has urged the 24-year-old to make a big impact in training. "I've asked him not to come as a youngster and be a shrinking violet," Rowntree told BBC Sport. "I want him to be a cat amongst the pigeons." England face New Zealand, South Africa, Samoa and Australia in November with less than a year until the World Cup on home soil. Kruis beat off competition from the likes of Christian Day of Northampton, Graham Kitchener at Leicester and Sale's Michael Paterson to make the 33-man party for next month's matches, and Rowntree believes he has the potential to prosper at international level. "For George to beat those guys in, it's extra special for him," Rowntree said. "We would have taken him to New Zealand in the summer, but he's been injured. "He's playing consistently very well. He's a very good lineout forward who has learnt a lot off (Saracens lock and former England international) Steve Borthwick. But the rest of his game: his carrying, ruck, defence work, his energy, his numbers, are exceptional. I'm a big fan." Kruis joins the established trio of Joe Launchbury, Courtney Lawes and Dave Attwood in Stuart Lancaster's squad and Rowntree says displacing one of those is not unfeasible. "I'd like to see him come in and mix it with the best of them. Then we will pick the best three for our match-day squad," he said. "It's a real opportunity for George." Rowntree also says he is happy England have the right balance in the back-row, despite the lack of an out-and-out "fetcher" in the squad. Chris Robshaw will again lead the side from the openside flank, with no place for Will Fraser of Saracens, while a move to bring back Steffon Armitage from France fell through last week. "I'd urge you to look at the fetching stats from the likes of Haskell, Robshaw, and Calum Clark. All of those guys can play six and seven," Rowntree said. "We're asking these guys these days to be good at lots of things." As for the November series as a whole, Rowntree believes England now have to start beating the best in the world on a regular basis. "It's about time we beat them consistently. I want us to start from where we finished off in the summer," he said. "We want to win them all."